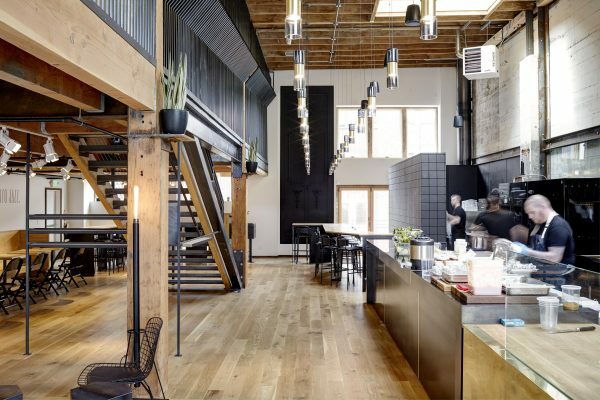 Meat & Bread is located in the recently completed Central Agency Building on Capitol Hill, an adaptive reuse of an auto row structure building that was converted into a storage facility decades ago. Beneath the corrugated metal siding hid a cast-in-place concrete building with large floor to ceiling window openings, old growth timber beams and columns, and open web hip girder trusses, all of which remain intact and have become the key elements we used to establish a sense of place. The light-filled north tenant space provided Meat & Bread with a character similar to their original store location. Our design embraced the weathered historical character of the building and left the original concrete wall behind the cook line as well as the heavy timber columns and beams untouched to highlight the juxtaposition between new ‘polished’ and old ‘rugged.’ A Lou Reed quote routed into back wall provides a hint of harmony.